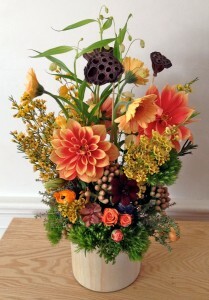 A custom autumn floral arrangement by Helen Stock of Wellesley, MA area based Helen Stock Floral Designs. Helen’s emphasis on color, scale and texture makes each arrangement a unique work of art for her clients. 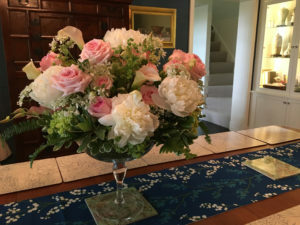 Helen Stock Floral Designs is a custom floral design studio based in historic South Natick, Massachusetts, 5 minutes from Wellesley center and serving the floral needs of the Boston metropolitan area, including Brookline, Newton, Wellesley and Weston. As a custom florist, Helen Stock’s work is distinguished by her individualized attention to the quality and unique character of each flower arrangement or container garden and attention to communication with each floral client. One of the most creative floral designers in the Boston, MA area, Helen Stock specializes in artistic flower arrangements with an emphasis on the interplay of color and texture. 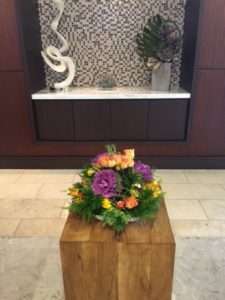 Helen can provide flowers for a single event or create custom floral arrangements on a weekly or monthly basis for display in your home or business; and she is known for not only her knowledge and creativity with floral design but also for her kind manner. 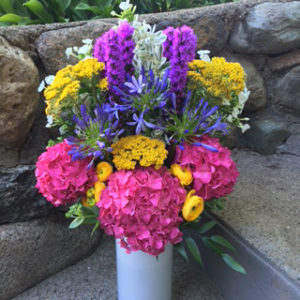 All floral arrangements by Helen Stock Designs are custom crafted by Helen personally, and she will do her best to include colors and/or types of flowers you particularly like, subject to seasonal and market availability. 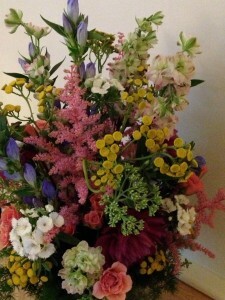 Helen has a high level of expertise regarding types of flowers and plants and tries to select flowers that accent shape, texture and color, creating a unique arrangement. People are often captivated by floral arrangements that Helen creates, as they are anything but the typical, mass produced arrangements one often sees. 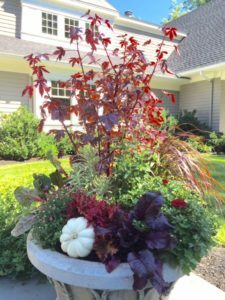 In addition to custom floral arrangements, Helen Stock is skilled at creating colorful and distinctive container gardens for both residential and business settings. and welcomes visitors to this stately private residence. 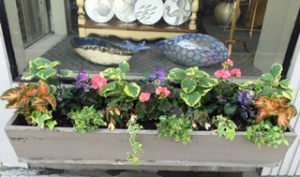 Custom floral container garden in the city by Massachusetts floral designer Helen Stock of Helen Stock Floral Designs. Despite their many appealing aspects, cities can still become austere places. Container gardens by Helen Stock Floral Designs, whether for an interior room or an outdoor patio, help personalize a space and make it your own refuge from the urban jungle. 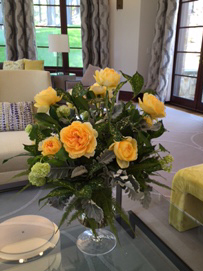 A custom floral arrangement can make any interior, from classical to modern, more beautiful and welcoming. 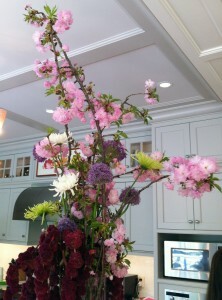 This tall flower arrangement by Helen Stock for an event in a residence reflects a sense of scale to the room. In addition to her work as a floral designer, Helen Stock is a nationally regarded expert in antique Oriental rugs and a partner in Boston area based Quadrifoglio Gallery. With more than 30 years experience in the decorative arts, Helen brings a distinguished sense of scale and color to her floral designs. Helen served as president of The Country Garden Club of Weston, MA during the club’s 50th anniversary year. 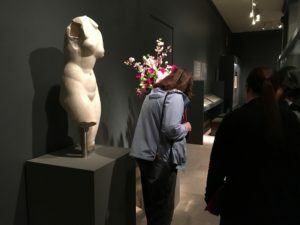 Helen received The Brister Bowl for her service to the club and Helen’s flower arrangements, representing the club, have been exhibited on four occasions at Art In Bloom at The Museum Of Fine Arts Boston. 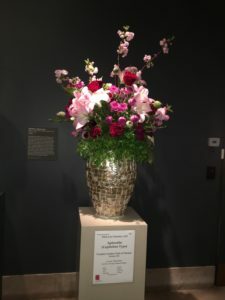 Helen’s 2018 arrangement for Art In Bloom at The MFA, done with a friend from the County Garden Club of Weston, was featured on the MFA’s Instagram feed. 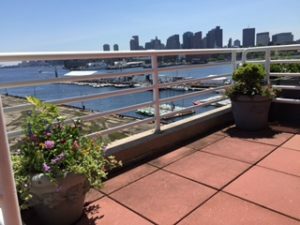 Helen Stock Floral Designs works with private clients, interior designers and businesses in the Boston, MA area, custom designing flower arrangements, container gardens and window boxes. 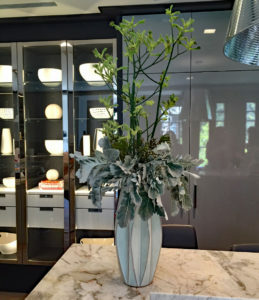 Helen’s arrangements have decorated the Boston area Louis Vuitton stores and her window boxes and container gardens can be seen gracing gardens and store fronts in Wellesley, Weston and other areas in and around Boston. For the quality of her work and concern with individualized attention to client care, Helen’s pricing represents a remarkable value, with costs frequently considerably less than larger competitors. Helen welcomes your call to discuss how she can help beautify your surroundings with flowers.